If there are two things that have taken the world by storm in yesteryears, they are Social Media and Vending Machines. So, now it is time for both of them to go shoulder to shoulder. Yes! That's correct. BOS Ice tea's BevMax 4.45:- This twitter activated vending machine is surely one the most innovative vending machines of all times. All you need to do is send a tweet to BOS twitter account @bos, which should include the hastag ##BOSTWEET4T and the free drink is yours. Not only this, but the LED on the vending machine also shows the name of the person who tweeted. This makes the entire thing more personalised. Technologically, this is fantastic because in order to reduce the fake tweets, they have used location settings options which determines whether you are nearby the vending machine or not. Coca Cola's 'Friendship Machine':- Coca Cola's gigantic drink vending machine offered 2 cokes for the price of one; however it required efforts to get 2 x 1. One couldn't reach up there without the help of at least one person. Sales of coke were reported 1075% higher than the regular vending machines which was amazing. 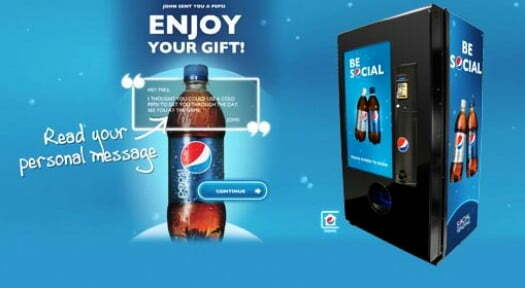 Pepsi's Social Vending:- Pepsi pioneered social vending machine in year 2011. A prototype that allowed a person to gift a Pepsi to his friend via the vending machine. He will receive a code on his mobile phone which he can use to redeem the gift at the nearby vending machine. Not only that, the one who gifted the drink, can also record a personalised message which his friend can see while redeeming the gift. This drink vending machine surely reserves the prerogative of being called 'Socially Innovative'.